Handcrafted Murano glass drops made with sterling silver lined amethyst coloured glass. Gorgeous stylish streamlined elegant earrings. Handcrafted Murano glass drops made with sterling silver lined Amethyst coloured glass. Wire wrapped to give great definition and a minimal streamlined look. Chic, smart fashionable. Ear wires are handcrafted with eco-friendly commercially recycled sterling silver. These Murano glass beads are also known as Venetian glass. They are individually handcrafted on the island of Murano, just off the coast of Venice, Italy. Each one is individual and unique. Length from the top of the ear wire is 4cm (1.6″). The gorgeous amethyst glass drop is approx 2cm x 1cm. These gorgeous earrings can be made in other colours. These include black, plum, bright light blue, topaz, peridot and silver white. Please contact me about ordering in these coloured beads. All items come packaged ready to give as a gift. I don’t include a printed receipt. A detailed receipt is emailed to you immediately after your order is completed. Sterling silver chainmaille earrings with black Swarovski crystals. <span”>Edgy, contemporary fashion, these amazing chainmaille earrings will add a modern edge to your look. Inspired by the amazing red lace dresses of Dolce & Gabbana these hand beaded red earrings are striking. 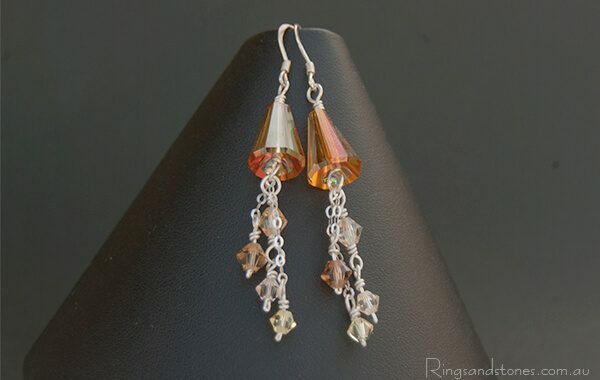 Hand beaded small sterling silver earrings with bright Swarovski crystal stones. Bright sparkly crystal earrings. Original hand beaded petite earrings.